The evening brought such pride to my heart. Main Street Guymon volunteers won their first Oklahoma Main Street Award. After 650 of us went through the banquet line, heard Governor Mary Fallin speak about how wonderful the program is for our state, we finally got to the announcing of the award winners. Main Street Guymon was up for five awards. The Premier Partner Award was for PTCI and their wonderful work with Main Street Guymon. The disappointment in not winning was not obvious on my face, I hope. The Community Education Award for our On the Bricks column in the Guymon Daily Herald and the On the Bricks with Melyn TV Show on PTCI’s Channel 2 came next. Beat again. Dang. I am pretty sure my face showed my thoughts that time. The third award on screen was the Main Street Volunteer Development Program for our Transformers. Shoot. We didn’t get to bring home that one. Hoping the wrinkles between my eyebrows wasn’t pronounced. I tried to act like I was happy for the ones who won. But at the time, I really wasn’t. In fact, I didn’t like them at all. Several more awards were given and then it was time for the Creative New Event. Yes! We won. Beat out two Tulsa Main Street programs. And all those others that didn’t make the final three. And it was even better than just winning. The winning took backseat in my love of how Fidel and Seaboard were such fabulous representatives of Guymon, of Texas County, of the Oklahoma Panhandle, and of the state. And I remember reading a letter to the editor who said Seaboard just made burgers. They knew so little when that letter was penned. So we won. The Azuma committee, sponsors (Seaboard Foods, Bank of the Panhandle, and City National Bank, and several churches and individuals), and volunteers won. Those that attended also won. Without everyone … no award. Congratulations to you all! We WON! At the banquet Guymon’s Main Street program had also made it to the Top 10 Communities list. Laverne won that one. This award is strictly based on points from attending trainings, meetings, Main Street Day at the Capitol, man the Oklahoma State Fair booth, and so forth. We made Top 10. That was a first for us, too. And I have to take the time to say many volunteers did those activities that brought points. Terry Brand attended the Preservation Conference in Perry for Main Street Guymon, Arlene Winfrey and Deb Drees and Terry Brand manned the Oklahoma State Fair booth, Dalia Estrada put together our booth for Main Street Day at the Capitol and she and Juan Estrada set it up and manned it that day. We have wonderful volunteers. Thank you to you all. And if you haven’t jumped on the Main Street Band Wagon, it’s not too late! 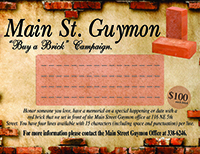 Join the Cash Mob that meets the second Monday at 5:30 and shops a Main Street Guymon retail store. Join the new Lunch Mob that meets once a month and has lunch at a Main Street Guymon member restaurant. Work at the Outback, Fiesta, Azuma, Livin’ Green Race, Oktoberfest, Five State Motorcycle Run, or other events with Main Street volunteers. Be a Shutterbug. Attend the Dementia Support Group. Help with the Community Clean Up (which is going to be monthly this year). Join one of the committees. Become a member. A business membership is $200 a year and an individual can join as a “Friend of Main Street” for $50 a year. We would love to have you join us. Or be a sponsor of a Main Street program like the Transformers, Cassie’s Project, Lunch and Learns, and the soon to be announced Healthy Moments. You might end up on the TV program or in the column, but you’ll get over it!